A thick calve is divided into muscular, fat-developed, fat-like, and mixed-breed types, depending on their shape. In our experience, many patients in our country have muscular legs, which can produce smooth legs with selective neuroprotection or muscle coagulation. However, depending on the patient, dual laser liposuction may be necessary. 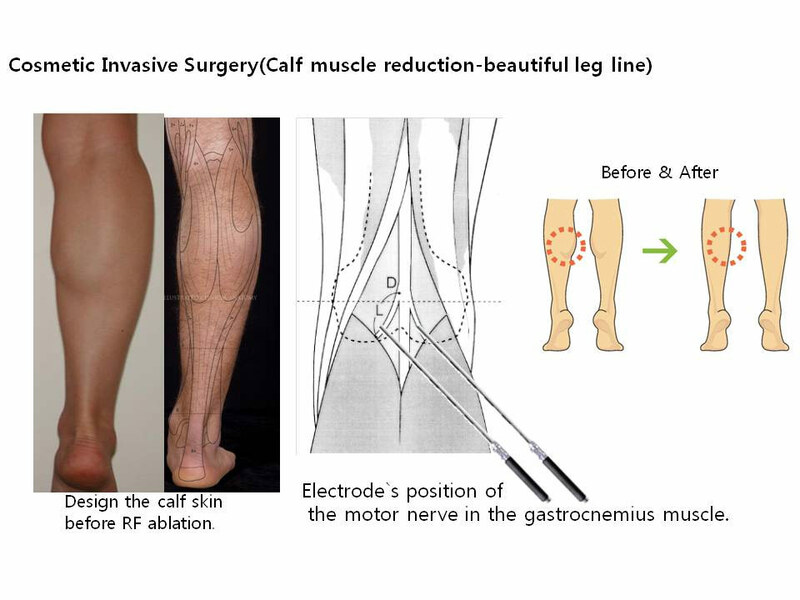 In Change Clinic, dual RF calf reduction surgery is performed to treat patients with high frequency nerve block and muscle coagulation. In the nerve block calf reduction surgery procedure, the process of "neurological exploration" to find the nerve to go to the gastrocnemius is very important, because blocking other neurons can cause side effects such as sensory abnormality. We use a special dual neuropathorist for the specifically designed calf procedure to find the nerve of the gastrocnemius precisely. When you find the correct nerve with a special dual neuro server, you are sure to block the nerve using high frequencies. High-frequency nerve block has been studied to have a lower recurrence rate than drug-blocked nerve blockers, and the high-frequency precisely blocked gastrocnemius volume is reduced over time and distinct calf muscles are removed in calf reduction surgery. There may be some swelling right after the procedure, however, it decreases just by wearing a pressure band for 1~2 days. The decrease of calf muscles will be distinct right after the procedure. This effect lasts for a month and eventually changes your leg into a thin and beautiful leg without the distinct calf muscles. After the procedure, some bullseye may have symptoms, but it does not interfere with walking. The advantage of high frequency selective neuroprotection is that it does not hinder everyday life.